U.S. patent law requires a patent applicant to furnish at least one patent drawing (sometimes referred to as a patent illustration) of the invention whenever the invention is capable of illustration by way of a drawing. Said another way, whenever a drawing would assist in the understanding of an invention patent drawings, or at least one patent drawing, is necessary. Based on my experience I can say that a patent drawing is almost always required, or at the very least you would do well to understand the rule as a patent drawing is virtually always required. In fact, the single best way to expand any disclosure is through the inclusion of quality patent drawings. A picture really is worth a thousand words and patent illustrations are essential for any application. For purpose of being completely accurate, I should point out that patent drawings are not always required, although only the most foolish applicants would ever proceed without patent drawings in my humble opinion. First, thanks to the Patent Law Treaty, which became effective in the United States on December 18, 2013, patent drawings are no longer necessary in order to obtain a filing date for a patent application. CAUTION! The fact that a patent drawing is no longer required to obtain a filing date does NOT mean that a patent drawing is not required if it would assist in the understanding of the invention. This change to the law merely says that it is possible that a patent drawing could be filed later than the filing date without risk of losing the earlier filing date. Again, CAUTION! You are NEVER allowed to add new matter into a patent application, period. If you need to add something you forgot after you filed a nonprovisional patent application you need to file another nonprovisional patent application to get a new filing date. The Patent Office has cautioned patent attorneys, applicants and anyone who would listen that the ability to secure a filing date without a drawing does not mean that new matter will be permitted at the time a drawing would be filed. Since drawings almost always add more than the text that would support them it is difficult to imagine what kind of patent drawings you could add after the filing date. Perhaps you could add stick figure drawings, but those won’t be particularly helpful. Thus, it is far better for applicants to ALWAYS file patent applications with patent drawings; as many as feasible really. The second circumstance where patent drawings are not required would be when you are claiming a chemical compound or composition. The formula would be enough and a drawing would not be required. Still, you will sometimes see patent drawings even in chemical patents. The third circumstance where a drawing may not be requires is when you are claiming a method. Having said that, even with methods there is almost always at least some illustration that could assist the reader (and patent examiner). Furthermore, the drawings are a part of the overall disclosure, which helps expand what you have disclosed to help ensure you have adequate support for the invention and the various permutations of the invention you will want to claim. For example, just take a look at the illustration below, which relates to a method and device for harvesting earthworms. From U.S. Patent No. 6,618,977. Yes, that is just a picture of a guy watering the ground with a chlorine solution. Does this help illustrate the method? Yes. Is it required, perhaps not, but the point I’m trying to make it that you can almost always depict something with an image, and if you can you should. You never know when you might need to make a very fine argument that your disclosure shows something and the only support you have is in a drawing. That might not be the best argument to make, but it is one that can and has prevailed in the past. According to the United States Court of Appeals for the Federal Circuit, which is the chief patent court in the United States, anything that is shown in the drawings is a part of the disclosure and can be used to support the claims. Of course, I don’t recommend leaving things out of your written disclosure, but if you accidentally leave something out of the text and it is shown in a drawing you are saved. 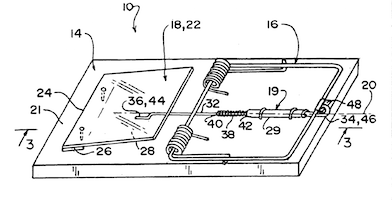 Drawings are your best friend in a patent application and provide a very nice safety net. A picture really is worth 1,000 words, and then some, so don’t skimp on patent drawings! In reality, you should also not think in terms of a single patent drawing or illustration, but rather in terms of however many patent drawings are necessary in order to demonstrate what you have invented. Most patent applications have at least several sheets of drawings, with each sheet routinely having multiple views of the invention. You may need to show various views (top, bottom, right, left, etc.) and you may need to break down the invention and show drawings of one or more of the component parts. The drawings should show every feature of the invention specified in the claims, and as you probably guessed given the peculiar requirements of the United States Patent and Trademark Office there are specific rules governing nearly every aspect of patent drawings. That is why you are best served to leave patent drawings to the professionals. They have years of experience, they don’t charge that much, and they really bring life to an invention. The Patent Office specifies the size of the sheet on which the drawing is made, the type of paper, the margins, and many other hyper-technical details relating to the making of the drawings. The reason for specifying the standards in detail is that the drawings are printed and published in a uniform style when the patent issues, and the drawings must also be such that they can be readily understood by persons using the patent descriptions. In reality, however, the drawings need to be electronically reproducible and given that patent illustrations are line drawings certain shading conventions need to be in place to provide a means for showing depth and various perceptions. Because the detail of the patent drawing is what saves you, having a professional patent illustrator is quite wise. Without question, the best way to broaden the scope of any application is to file the application with multiple, detailed and professional drawings. The benefit received from professional patent illustration is well worth the investment. When dealing with mechanical inventions I am a particular fan of exploded views, which show all the pieces and parts in a state of suspended animation about to collapse backward into the finished product. An example of an exploded view is shown below relating to a semiconductor device. From U.S. Patent No. 6,404,042. Now, how do you make the drawings? To be honest with you I don’t know and I don’t want to know. There are so many rules and regulations with respect to patent drawings that I would rather focus my time and energy on the law and the process than on meeting the technical requirements and also trying to figure out a drawing program. This is, in fact, the way virtually all patent attorneys and patent agents treat drawings, which is why we turn to professional patent illustrators to do drawings for us. The benefit of hiring someone is that these folks specialize in patent drawings, they know all of the little picky details, and the drawings they make will be accepted by the Patent Office the first time around. You will probably be surprised at how affordable it is to hire a professional patent illustrator. Typical charges can run between $75 to $125 per drawing sheet, depending upon the complexity of the invention, with design patent illustrations being more expensive. The cost of patent illustrations is very reasonable in light of the importance of drawings and the peace of mind associated with knowing that a drawing has been done right. Thanks for the article Gene. I always advise my clients to give me the best drawings that they possibly can. If they have some CAD/drafting ability, it is one of the best ways to save money. For those that can’t, a professional is a good investment. They sure don’t want me trying to draw anything beyond simple illustrations. I have also found that a good series of patent drawings helps during prosecution. No examiner wants to wade through the horror of bad drawings. Some times drawings are provided with full specification including claims in utility patent application. In the specification broad description tries to cover alterations / modifications. But the claims are based on drawings only. I want to include alternation / modifications to achieve the same process/product of my invention, without changing the date of application. By submitting the drawings of the alterations/modification, can the inventor amend the application without changing the application date?